The Interactive Resource Center is an online learning environment where instructors and students can access the tools they need to make efficient use of their time, while reinforcing and assessing their understanding of key concepts for successful understanding of the course. An access card with redemption code for the onlineInteractive Resource Centeris included withall new, print copiesor can be purchased separately. (***If you rent or purchase a used book with an access code, the access code may have been redeemed previously and you may have to purchase a new access code (ISBN: 9781118990179). Get up to speed on the latest codes with the complete reference for interiors. 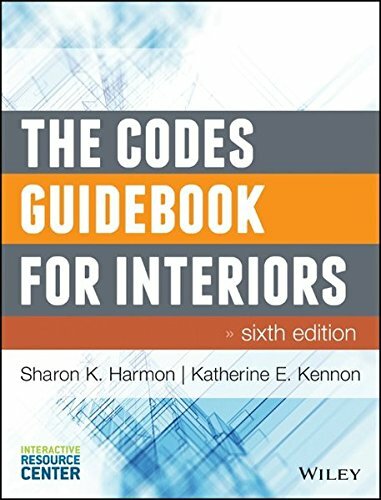 The Codes Guidebook for Interiors, Sixth Edition is the standards reference of choice for designers and architects, and the only guide devoted exclusively to codes applicable to interiors. With jargon-free explanations of all standards and regulations of concern to designers and architects, the book takes readers step-by-step through the codes relevant to each stage in the design process. The updated sixth edition features the latest information on fire codes, performance codes, building and finish standards, energy codes, and accessibility regulations, plus enhanced illustrations that clearly demonstrate how codes apply in real-life scenarios. Having all applicable codes in a single resource saves hours of research time, and can dramatically reduce the potential for costly planning oversights. Whether renovation or new construction, small or large, codes apply to every project. The Codes Guidebook for Interiors provides designers with the comprehensive information they need to stay up-to-date.